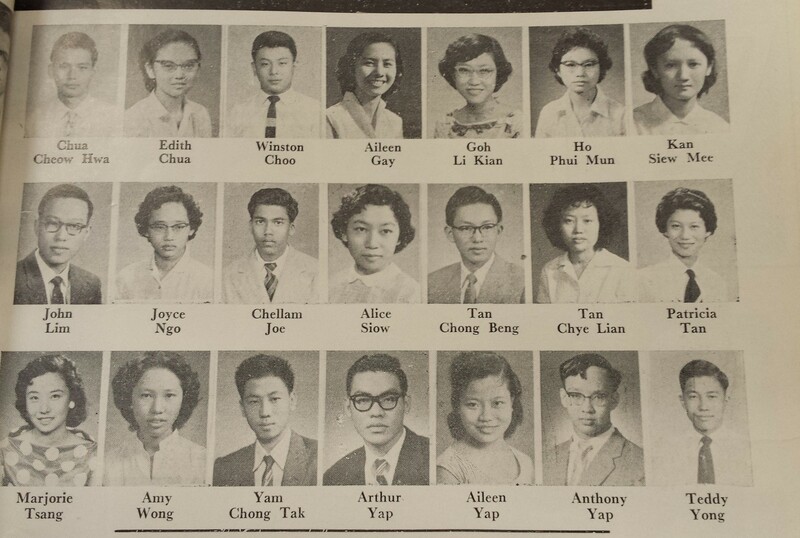 Mr Arthur Yap grew up in the 1950s in Singapore, and moved to Canada with his wife in the mid-1960s. Other than having a career in real estate in Vancouver, he has been, at various times, an active leader of the Vancouver Singapore Club and a long-serving head of the NUS Alumni (Vancouver Chapter). He is the nephew of Dr Yap Pheng Geck, a well-known community leader in late colonial Singapore, whose stories and memories are collected in the publication Scholar, Banker, Gentleman Soldier: The Reminiscences of Dr. Yap Pheng Geck (Singapore: Times International 1982). This abridged interview with him focuses on his memories of being a boy in the 1950s. He grew up in an Anglophone family and received education in English-medium schools and in the University of Malaya in Singapore. Arthur and his friends would have heard Cliff Richard and the Shadows on the radio and sang and danced to “The Young Ones” when the song broke the charts in 1960. EL: Arthur, where and when were you born? AY: I was born in Singapore, on April 18 1940. EL: What were the earliest memories of your childhood? AY: Oh, during the Japanese Occupation of Singapore, among other things, OCBC, the big bank, sponsored, I believe, about two hundred and fifty families in Singapore to live in a place named Endau. So my earliest memories is of living in the jungles of Endau, with two-hundred and fifty other families….And my father, before we had to go to Endau, was an agriculturist [or an agriculturalist] with the Singapore colonial government, in charge of agriculture. Our family friend Desmond Neill, formerly of Fraser and Neave, reminded me that my father was also in charge of fisheries. EL: Could you tell me more about your family? AY: Yes, my dad was a very important influence on my life… my parents were very staunch Christians. My father was raised in Anglo-Chinese Methodist School. So was my late uncle. My mother was from a Methodist School in Ipoh in Malaya. I’m not sure how they met… My immediate family, there were four of us children– two girls and two boys. I was spoiled by my father because I was the number one son. ..But I’m part of a bigger extended family as my grandfather had three wives. So then, I have many cousins. Two of my Yap aunties, my father’s sisters, married two Seah brothers. So then the Yap and Seah clans were very, very big, so my extended family is huge. Although I did not realize it at the time, to a great extent, I lived in a very privileged family environment. In the 1940s, 1950s and 1960s, there’s not many people with university education. My father was a graduate in agriculture from the Serdang College of Agriculture in Selangor. In the old days Singapore and Malaya were part of one unit under the British government. And because my father was one time Director of Fisheries and Agriculture, when I was young, every weekend, we went by motorboat from Punggol to Pulau Ubin island to spend a day at the house of the fishermen. The fishermen had kelongs (EL: floating fish farms). We had a motorboat parked at Punggol. Every weekend, Sunday particularly, we spent the whole day at Pulau Ubin. And the fishermen were my father’s friends. They protected my family when the Japanese occupied Singapore. Some of my relatives, my second uncle, Ewe Hai, was slaughtered, killed. My oldest cousin from my eldest auntie, was also killed. Uncle Pheng Geck was put in jail by the Kempeitai. EL: How did the fishermen protect your family? AY: Well, my father was a top civil servant for the British colonial government. When Japan occupied Singapore, they put his bosses, English bosses, in jail. My father was dumb enough to go and visit his English boss in Changi Jail. And my father told me he had a big scolding from his boss: “Never ever ever come again.” My father was very, very pro-British. Hence my command of the English language. 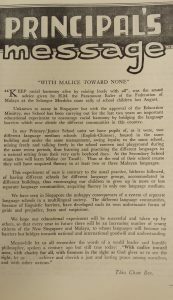 My father told me, from the day I was born 77 years ago that to get a good job in British colonial Singapore, you must write and speak good English. And he was right. EL: What did your family do there, when you were at Pulau Ubin? AY: Enjoy ourselves, picnic…my father, had a car, had a house, and sometimes a driver too. So it was quite a privilege. And my father’s word was law because he represented the government. But my father was a great Christian and he became good friends with the farmers and with the fishermen and they loved him very much. After he retired, they still brought chicken, and eggs, during Chinese New Year, to our house. EL: Where was your house? AY: Initially, at Government Quarters at Medan Road, not in existence any more, where the civil servants lived. And that’s my earliest memory as a schoolboy. EL: How many people were there in your house? AY: Just my family: my parents, myself and my three siblings. EL: What was childhood like? AY: For me, it was enjoyable, fun, I had good food, I was shy…then when I reached the age of puberty, 14, or 15, I got into sports, I was also a Boy Scout, so I was very active. 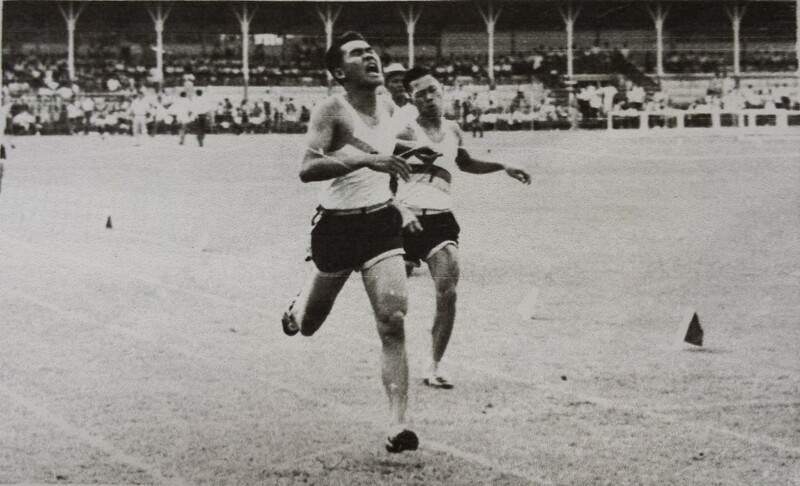 I was a champion athlete in Anglo-Chinese School. EL: What was a typical day like? AY: Of course, go to school, Anglo-Chinese School, at Coleman Street. The secondary school is in Bukit Timah, where the Tower Clock is. Go to school, come back. EL: What did you learn in school? AY: My schooling was very very British. Don’t forget we were part of the British Empire, this was the British colony of Singapore, so I studied things in school like Aesop’s Fables. I read Enid Blyton’s books. It’s all very British. Nursery rhymes – Humpty Dumpty Had a Great Fall. I was very excited to read about the Knights of the Round Table. EL: What were the subjects you took? AY: Primary school I don’t remember. The basic things, writing, arithmetic and all that. Then high school, they separated us – those of us who wanted to do science, and those that wanted to do arts. So I was not smart enough to get into science class, the science class were the people who were going to be future doctors and scientists, I was in the arts class. Like all young kids, I wanted to be a doctor but I didn’t qualify so I was quite broken-hearted initially. But my younger brother became a doctor, he got a scholarship. EL: Did they encourage athletics and sports? What kind of sports did you play? AY: Yes, they encouraged sports. ACS, the motto is “the best is yet to be” but the other motto is “Mens sana in corpore sano” – “A Sound Mind in a Sound Body”. I didn’t play team sports, I was a track athlete. I made my name in the 440 yards. In the old days, it was not the metric [system]. Then I went on to 220 and then to 100. I even ran a half mile but I made my name in the quarter mile. And then in my school, in the old days, they don’t have it now, but many many years, until I finished secondary school, the English- medium schools had inter-school sports and I ran in the old Jalan Besar Stadium…(EL – The Chinese-medium schools had their own inter-school sports day) it was very prestigious to win at sports. Sports was encouraged by my school. EL: Did the teachers encourage you in any way to be loyal to the British Crown? EL: Do you remember the exact years you were in ACS? AY: I was born in 1940, so 7 years old, I went to school at the age of 7, primary school, then after that secondary school. EL: What subjects did you study in secondary school? AY: Scripture was compulsory, and Religious Knowledge because it was a mission school. You get streamed to science and to arts at standard Six (now secondary three). EL: In the 1950s, did you notice if the British government began to give more emphasis to education? EL: You mentioned that you were involved in the Boy Scouts…was that from primary or secondary school? What made you join the Boys Scouts? AY: …I think secondary school. Because my teacher, Ang Cheng Kim, was a prominent and well-known teacher in Anglo-Chinese School. And he was the Scout Master and he knew me from very young…. 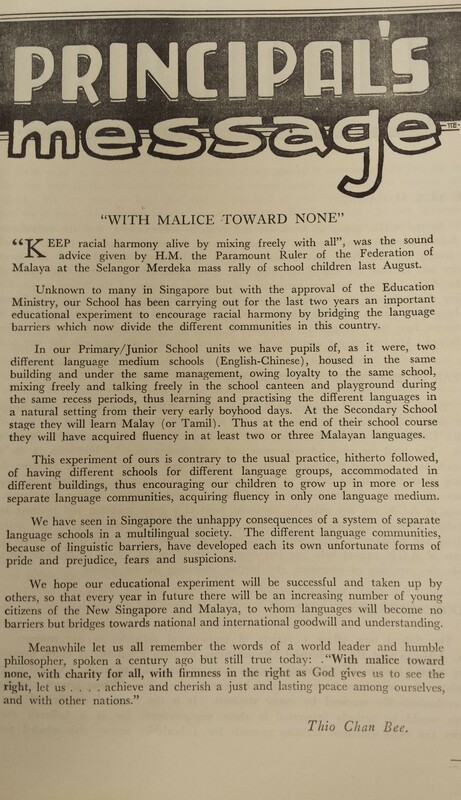 because of his influence I joined the outside troop, not the ACS troop….not my school’s troop, my school’s troop was Troop Number 11, the outside group was under Goh Chin Chye – Dolphin Troop. Goh Chin Chye was also a school teacher at ACS so that’s why I joined and I had a lot of fun in the Boys Scouts… I became a Patrol Leader, camping, scouting, job week – volunteering to clean houses to earn money for the Scouts, knocking on doors of neighbours and friends…We meet at least once a week, there was a scout Headquarters, the Dolphin Troop used to meet there, at Armenian Street. EL: Did you get any sense that the Boy Scouts was a colonial institution? AY: Not to a great extent, but to some extent, because the Boy Scouts’ motto “Be Prepared” came from Lord Baden-Powell, the founder of the Scouts in England. But I think, as a young boy, the British training and government wasn’t very intrusive, to me. I took everything for granted, the government is doing all these for us, they allow the Boy Scouts to do all those … it was very very British…For example one of the songs I learnt as a Boy Scouts was …”Under the spreading Chestnut tree, oh how happy we will be.” So many years later, I saw a clip of the 2nd World War, and King George VI of England, singing the same song….So we were very British in our upbringing. We imbibed British values like justice and fair play, honouring your words, Knight’s Prayer. My uncle Yap Pheng Geck, went to different mission schools to make speeches, brought along this photocopy of the Lord’s Prayer and the Knight’s Prayer. And the Knight’s Prayer says “Let me have no spot on my shield”, help damsels in distress, very noble ideals, which I imbibed to this day. EL: Do you think the Boy Scouts mattered a lot to your character-formation? AY: Definitely, and the leadership qualities. 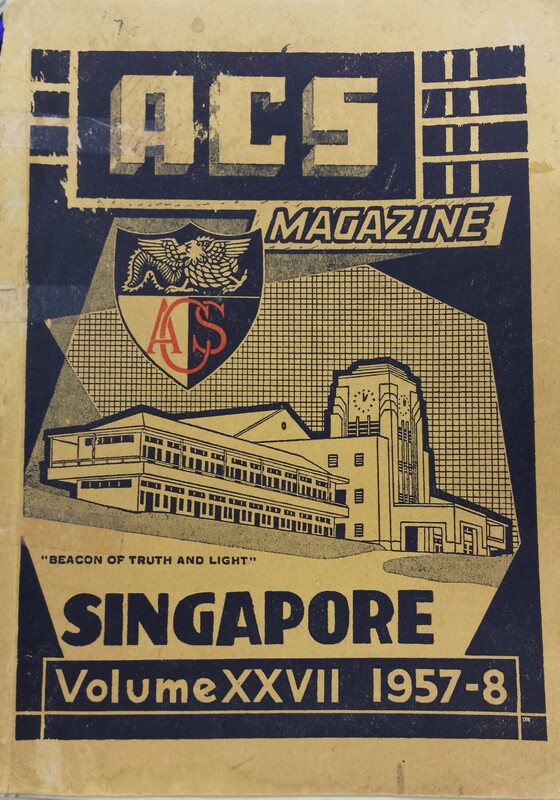 I was a Patrol Leader, I was an Athletics team leader, in Goh Hood Keng House at ACS. Reverend Goh Hood Keng is the pastor who married my parents in the church and when I got married 35 years later, I made the same vows, used the same words in the same church, my father said he shed a few tears. So very traditional, typical British, Methodist training, I enjoyed the Methodist Youth Fellowship very much… there was singing, and I loved singing. I was in the choir of the Kampong Kapor Methodist Church. Kampong Kapor Methodist Church was like 150 years old. EL: Did these occupy a lot of your time? AY: Some of my spare time, then I started athletics, when I was 15 years old. Most people start athletics at 13 or 14. In my school, Anglo-Chinese School, there was a prominent student… Chan Onn Leng, he became a medical doctor. He topped the school in the Senior Cambridge exam, at the same time, he was a champion athlete… he came back to encourage us on the sports field, and that’s why at the late age of 14 and a half, I decided to train for sports. EL: Other than being a Boy Scout and athletics, what were your other non-school activities? AY: I was also in the Methodist Youth Fellowship, I was very active there, and my speedy transportation was my iron, two-legged iron horse, my bicycle and I used the same bicycle all the way to university. EL: What was it like cycling? Was it safe? AY: Very safe, but you still ended up with accidents. My sister rode her bicycle to school also, fell and broke her head and ended up in the hospital. EL: Did you play any games? AY: I played maybe a little bit of badminton, I was interested in swimming, because another scout leader was a lifeguard. At one time I trained to be a swimmer but because I caught colds so often when I was swimming , I switched to athletics. EL: How about the weekends? What would you be doing? AY: In my younger days when my father was working in the government, weekends was always picnics, at Pulau Ubin Island, but when he left the job, then we were on our own. I loved to read, I spent a lot of time in the old National Library. My father, being himself a bit of a scholar and a graduate which is very rare for his time, he encouraged me to read Thomas Hardy…also The Count of Monte Cristo…all these great books. So from very young I was encouraged to read. EL: How was Higher School Certificate (HSC) (EL: 2 years Pre-University course after the completion of secondary four, ran by selected secondary schools) different from secondary school life? AY: Totally different, we had girls in our class, from Methodist Girls School, from Singapore Chinese Girls School, and we had very rich classmates, so we went to their houses or bungalows, at Pasir Panjang. Pasir Panjang is a rich men’s area, e.g. Aw Boon Haw…so totally different life… lots of socials… I went dancing and all that. I started dating… a lot of fun! EL: Where did you all dance? EL: Where did you all used to have the picnics? AY: Pasir Ris, where now it is the airport… near Changi… there was just coconut trees and beach. EL: Why Pasir Ris? It’s quite far from where you used to stay. AY: It was organized by the whole class. That’s one of the few places to picnic in Singapore, right by the beach. EL: What sort of games would you be playing at these picnics? AY: I don’t remember now, all sort of games. Students’ games. EL: What was dating like? What did boys then do? EL: At what age did you do your HSC? AY: When I was in HSC, I was already 18 or 19, so 13 years in school, including 2 years of HSC, and then 3 years university. EL: If you were so involved in social activities, was it hard to qualify for university? EL: What were the subjects you took at HSC? AY: Geography was only in secondary school, I don’t remember doing Geography in HSC. AY: I don’t even remember there was such a thing as Civics. AY: Huge difference between university and secondary school. Seniors came and bullied you, we had ragging… they bully you, make you sing a song, ask you “do you know my name, who am I”… I got scolded by my seniors…. I did not believe in ragging, it’s a form of bullying! But ragging was the way you got to know the seniors. But it was quite mild 90% of the time but it got so bad they abolished it. Because of the horrible things that the seniors made the freshies do, that the Singapore government banned it. EL: Was there a lot of expectations on the university students? AY: Yes, it was every parents’ goal for their children to go to university and that’s why I had to go to university, to break what we considered the poverty cycle. If I don’t go to university, I would never break the poverty cycle ( EL: After Arthur’s father retired from the colonial Civil Service, the family lost the income and government housing that came with the job. The pension Arthur’s father received went towards medical expenses)… And my wife never went to university, because boys are favoured – her older brother went to university. If she had gone to university she would have ended up being a professor in English Literature. EL: What was the syllabus at the University of Malaya like? AY: Very easy, at the first year I took 3 subjects – English, History and Economics. After the 1st year, they stream you. I did not qualify to go into Honours. Honours in Economics was a very popular subject…. I continued with the 3 subjects for my 2nd and 3rd year. I graduated with a General Degree. I thank God that I took a General Degree because I took History, Economics, and English Literature… I’m glad I had a broader education. In History, I got to study the history of Egypt, Gandhi, Indian colonial history, Qing dynasty, Tang dynasty. In Literature, my favourite were the Romantics – Shelley, Byron, Wordsworth and all that… so blessing in disguise that I didn’t qualify for Honours for I could take all three subjects. EL: When you were in the university, what kind of social activities or extra-curricular activities did you take part in? AY: To be very blunt, such a poor boy, father on a small pension of $250, my father got sick, he worked too hard for the government, he went on medical retirement early. So no money, no nothing, I was giving private tuition to pay for my fees…I was giving private tuition full-time, attending lectures part-time, but I still passed because English – History, Literature… I was not likely to fail in subjects that required essay writing. EL: Were you still involved in athletics, Boy Scouts in university? AY: Stopped, all stopped, everything. Survival. EL: So you graduated in 1963 after 3 years in the University in Singapore? AY: I graduated in June and I got married immediately. We were dating from my HSC days. She was waiting for me. And I was riding my bicycle that I bought when I was 12 years old…That time my father was a government servant so he had money, right? So when I was 12 years old, he said to me “Arthur you are 12 years old, it’s time to buy you a bicycle.” So he brought me to the bicycle shop…. I looked at several bicycles, I bought a man’s bicycle. I was only 12 years old, so a man’s bicycle was actually too high for me! You got to stretch more. So my father was very puzzled. He told me this story many years later. He said, “Arthur why do you want such a big bicycle?” I told my father, according to him, “one day I’m going to grow up, I will need a bigger bicycle.” See how I planned ahead? And I used that same bicycle until second year university when Angeline (EL – whom Arthur married on graduation) felt sorry for me and she bought me a Honda 50cc motorcycle! EL: Was Angeline working when you were in university? AY: Shell company. Top secretary. Top brains. EL: She could only work as a secretary? AY: No university degree! Senior Cambridge. She got a promotion every few months. AY: No choice! No money, she had to bring in money to support the family, support her brother through university, until she got married. EL: In your mind, when did your “youth” end? AY: After university. No more a kid, no more in school, got to learn a living. And my philosophy is, the husband is the breadwinner.